I’m wrapped up in a plastic bag, lying on a table, with my head inside of a glass bubble. No, I’m not recalling a dream I had about aliens—I’m getting a treatment with celebrity aesthetician Ildi Pekar. The skin-care and wellness guru, who pulls inspiration for her products and treatments from her home country of Hungary (like using colloidal silver in her facial mist), just introduced a new service at her spa called “alkaline therapy.” Basically, it’s supposed to be a fast-track to a full-body detox—all within an hour. “With this treatment, you eliminate the acid in your body so that it’s alkaline and bacteria isn’t able to thrive,” she says. According to her, this helps the oxygen to better penetrate your body, which has wide-ranging benefits that bolster everything from your muscles to your skin (good news for my Barry’s Bootcamp-ridden legs). Though you don’t feel much during the treatment, it’s working hard to zap harmful, positive ions from your body so that you’re in a newfound state of well-being. What does that feel like? Keep reading to get the scoop on the latest wellness treatment making waves: alkaline therapy. Similar to the diet, being alkaline means being more neutral—not too acidic or basic—so that your body can function optimally. “When your body has a lot of acid in it, you can get sicker, [you could potentially have] more fine lines, cellulite, pigmentation, and the list goes on,” Pekar says. As with so many other unhealthy things, acidity can also create inflammation—so by that thinking, this treatment is anti-inflammatory. According to Pekar, it’s hard to remain in an alkaline state because even things like stress, a poor diet, and lack of sleep can throw things out of whack. Though the treatment looks like a futuristic machine attached to a cot you lie down on (with a clear helmet, to top it all off), it’s actually quite relaxing. First, your body has to be completely covered so that only oxygen and negative ions can come in. Before you’re put inside of a bag, Pekar (or another esthetician) slathers your skin with an electrolyte gel that’s full of vitamins and nutrients. 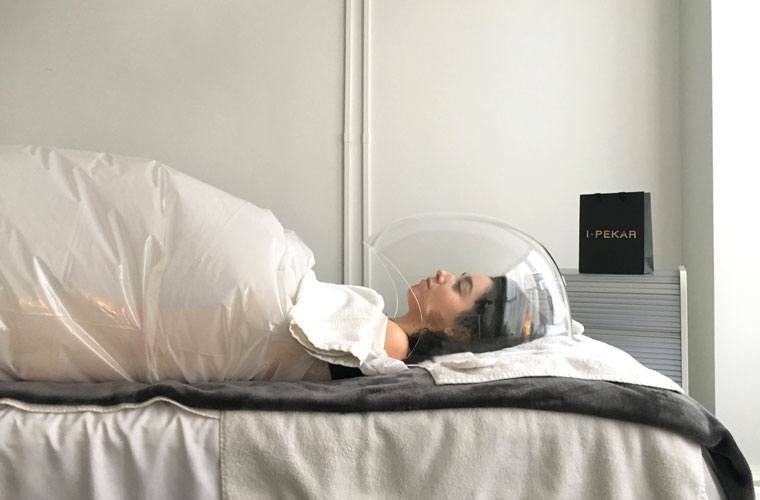 Then you lie down on a treatment table—where your head is inserted under a glass helmet—to help make the alkaline magic happen. As you rest, your body and face are fully exposed to water-based negative ions. In actuality, despite all the invisible detoxifying going on, it just feels like crisp, cool air. The goal is to zap the positive ions, which are essentially the nemeses of your well-being. These are the toxic particles that can come from technology, pollution, WiFi, and even fluorescent lighting, according to Pekar—all things you’re likely exposed to on the reg (guilty). The benefits come when the negative ions neutralize the positive ones, resulting in a full cleanse of your body. “Generally speaking, negative ions increase the flow of oxygen to the brain; resulting in higher alertness, decreased drowsiness, and more mental energy,” says Pierce J. Howard, Ph.D, author of The Owner’s Manual for the Brain. Pekar suggests that the benefits are even more wide-ranging, leading to a rejuvenated complexion, less-sore muscles, boosted immunity, and overall relaxation. I will say that, despite not feeling completely different after receiving the treatment, I did feel rejuvenated and as if something zapped a restart switch on my body. I got up feeling incredibly chilled out and ready for a good night’s sleep (which I succeeded in getting), my skin had this—dare I say—extra-glowy dewiness to it, and I just felt healthy. It wasn’t a huge difference, but I suppose the inside of my body would beg to differ. Besides this, here are the out-there wellness treatments that actually work. And this is how much money real women *actually* spend on wellness.